Recently, Rouge Bunny Rouge released depotted refill single eyeshadows alongside empty duo and trio palettes to make customized palettes (check on Zuneta.com). 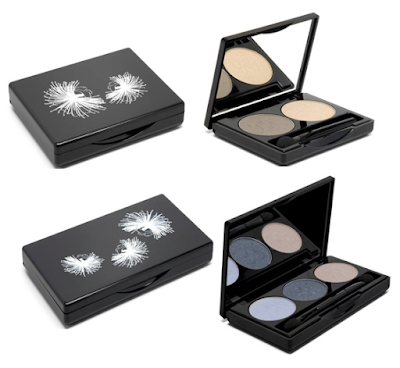 The palettes run for $19.38 (duo) and $24.23 (trio) while the refill single shadows run for $25.85 for 2g. NOTE: Prices converted from GBP£ to USD$. Now, for a tiny little order I placed despite my no-buy was only because I couldn't give up the chance to get a particular eyeshadow I had been lemming for ages (was always out of stock): Abyssinian Catbird. First up is the obligatory box + packing picture. I adore the packaging and love the sleeve the refill shadows come in; highly preferred over the compact versions which I'd depot anyway. 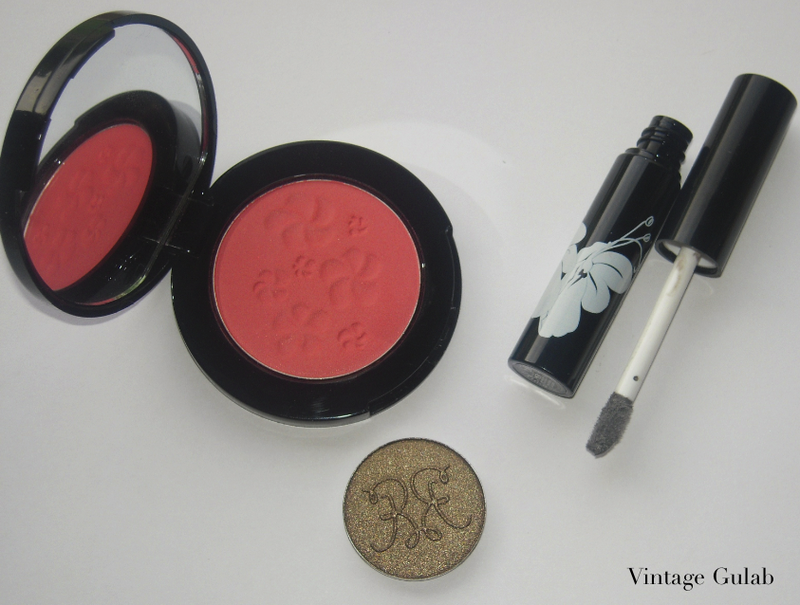 I also picked up a blush in Orpheline, and along came a GWP Long-lasting Cream Eyeshadow in Batiste Grayling. 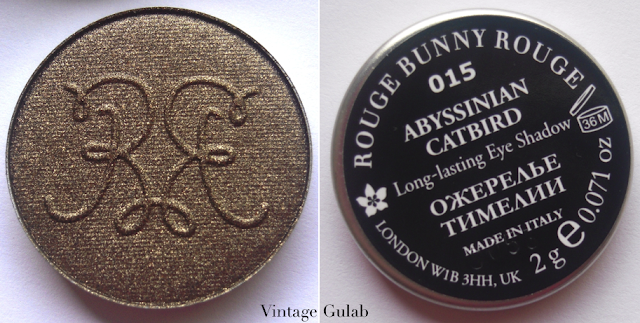 Abyssinian Catbird ($25.85/2g) described as a "metallic bronze with golden highlights" pulls slightly green in pictures but once swatched is a bronze-gold with a gorgeous shimmer. 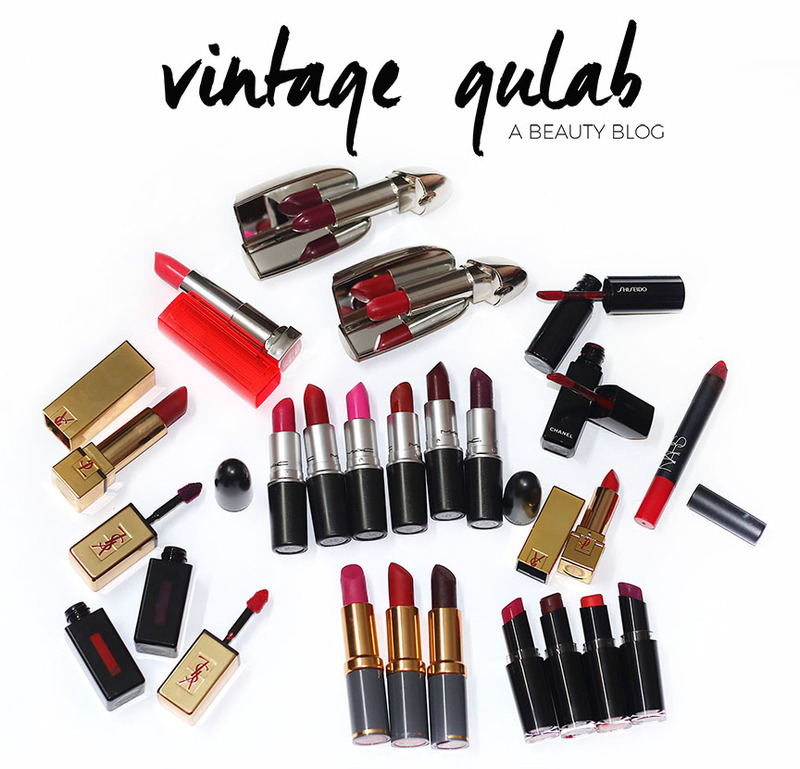 The formula is superb and buttery-as-heck smooth and the color is gorgeous! I have a soft spot for colors which can be blended out to create a smokey eye giving the look of a more elaborate look. Abyssinian Catbird, if heavily swatched, looks gold-bronze but once blent out the green-gold undertones start to come out making it perfect for the one-eyeshadow look. 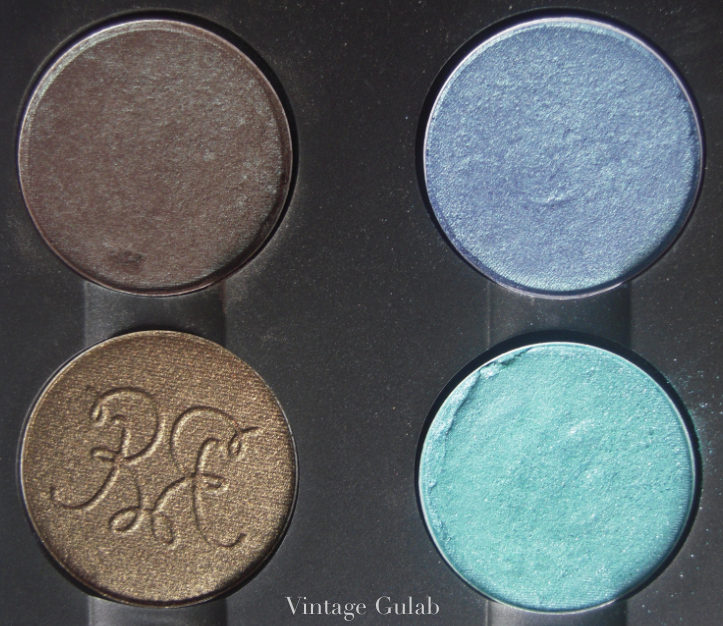 If you're new to RBR eyeshadows (like I was) this shadow is a great introduction to the range of RBR shadows. Plus, the color is quite unique (at least within my collection). As for the size, the pan fits perfectly into a MAC palette and is slightly smaller than the compact pans which are $ 35.49/2.4g (refills are 0.4g smaller). But if you're like me and prefer to depot single shadows, you're much better off buying the refills. Orpheline ($40.33/3.5g) is described spot-on as a "warm strawberry-pink". 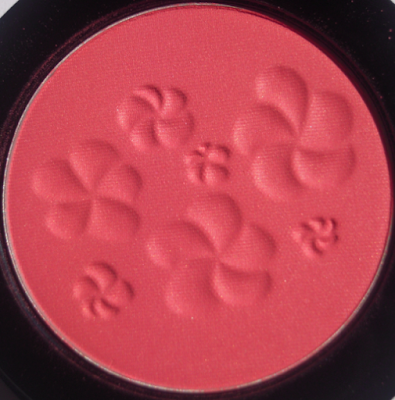 Rouge Bunny Rouge blushes have a certain creaminess which is apparent from the indentation they get if pressed and blend beautifully on the skin. Even on bare skin they don't get patchy whatsoever. And how darling are those flowers? Love cute detailing like that! I'll be posting some comparison photos of this and a few other blushes of the same color range for comparison purposes. 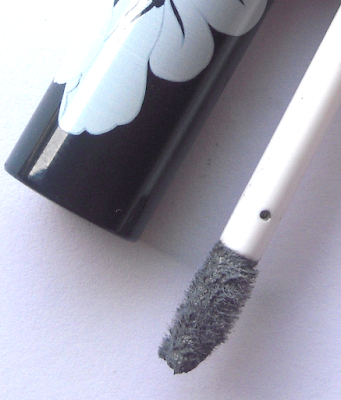 And last but not least is a cream shadow in Batiste Grayling ($41.94//4 ml). Described as a "satin wash of cool, true medium-grey". Rouge Bunny Rouge cream shadows, comes in a tube with a doe-foot applicator and I'd describe the color as a cool grey with a slight taupe-ness. 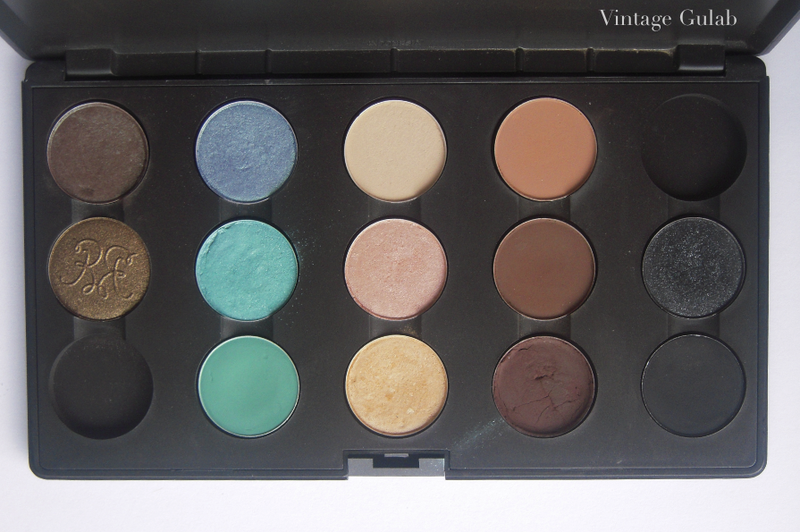 Unlike many cream shadows, this sets and doesn't budge AT ALL. I tested this without primer and it lasted all day. 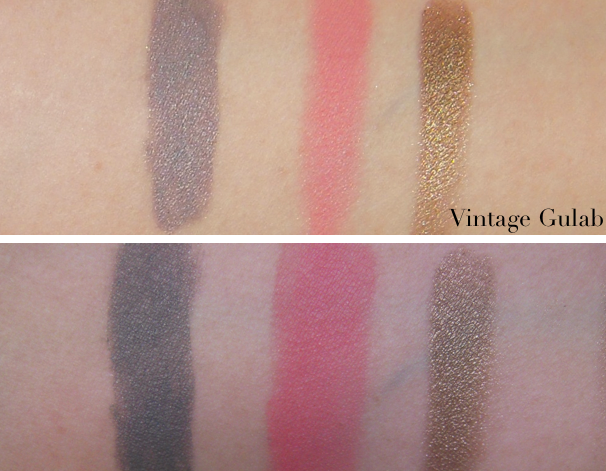 Even after swatching, I tested it by rubbing and it didn't smear whatsoever. It does set completely and has a "tightness" to it but it doesn't feel uncomfortable whatsoever. I also like the doe-foot applicator because using a synthetic brush would probably waste too much product. And because these set, you must work quickly to blend it out. I can already see the perfect sultry smokey look using this. Also, something about this is very reminiscent of Maybelline's Color Tattoo in Tough as Taupe. And now for swatches! Taken with and without flash. On top, with flash, you can see the undertones as well as the refined shimmer in Abyssinian Catbird. Colors are more true-to-color on the bottom taken in natural light. Beautiful girly! The only thing I don't currently own is the Batiste Greyling. Looks very pretty! Thank you! And Florita is definitely on my list. Plus, I like to have things in even numbers. >.< But yes, Florita and Orpheline are definitely similar but I believe Florita is a bit more mauve. Ah I am loving Batiste Greyling. Abyssinian Catbird would look amazing with those turquoises and soft blue above it.